Shield Argent with base wavy of Azure and Argent, an eradicated chestnut tree Vert fruited Or, issuant from base wavy two watermill wheels Gules in fess. 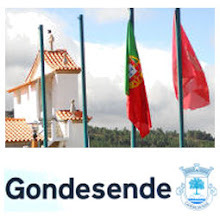 Mural crown Argent with three visible towers (village rank) and white scroll reading in black upper case letters "GONDESENDE". Gondesende Commune is one of the 39 communes of Bragança Municipality; it had 194 inhabitants in 2011 and covers 12.9 km².